Kandinsky’s vantage point for this 1908 view of the main street of Murnau can still be seen today. Little has changed in this small Bavarian town nestling at the foot of the Alps since its beauty first attracted Kandinsky, Gabriele Münter, Alexej von Jawlensky and Marianne von Werefkin in the summers immediately before the First World War. Although Murnau, Houses in the Obermarkt was not dated by Kandinsky, the Russian artist’s rapid move towards abstraction at around that time leaves little doubt as to its dating. The work has echoes of the Fauve idiom Kandinsky had seen in Paris in 1906 and 1907, though here he opts for a more compact handling of the view and for a somewhat darker palette in a work where the colour is clearly fighting to become independent from the model. For Kandinsky, the years between 1904 and 1908 were years of travel. Much of this time was spent in the company of the young German artist Gabriele Münter, whom he had met in Munich in 1902. During 1904-1905 they visited Holland, Italy and North Africa. The couple was in Paris from 1906-1907, and spent six months in Berlin in the winter of 1907-1908, finally returning to Munich in the summer of 1908. From then on, they divided their time between the Bavarian capital and the village of Murnau, some fifty miles to the south of Munich, which they first visited together in the course of a brief excursion in mid-June 1908. 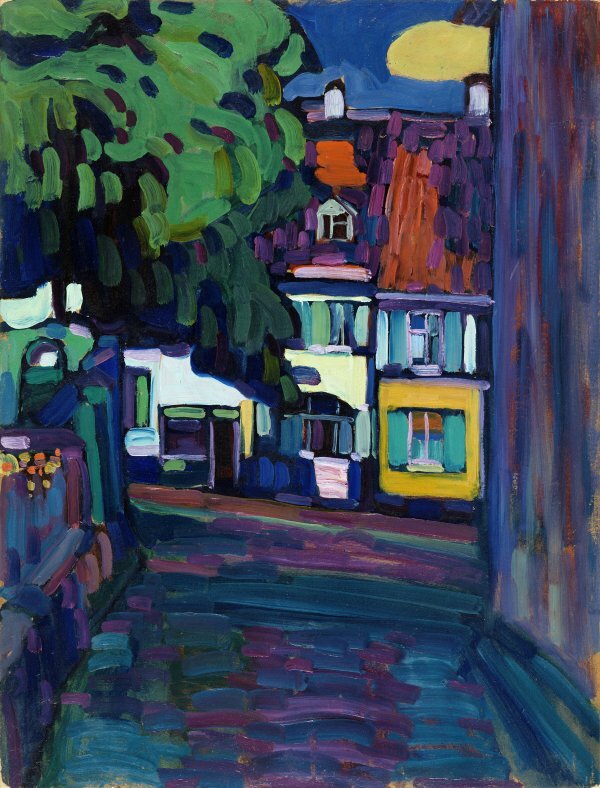 Both fell in love with the place and, egged on by Kandinsky, Münter bought a house there in August 1909. From then until the outbreak of war in 1914, she and Kandinsky, often joined by other artists including Kandinsky's compatriots Alexei Jawlensky and Marianne von Werefkin, spent part of every year in Murnau, especially the summers. The village and its surroundings (Murnau is picturesquely situated in the foothills of the Bavarian Alps) provided a repertoire of subjects to which Kandinsky returned constantly during these crucial years which also saw his increasingly radical development towards an abstract style of painting. Though Houses on the Obermarkt is undated, the artist's stylistic evolution during these years is so rapid and so decisive that there can be little doubt that this is a work of 1908, done at a time when the influence of Fauve paintings he had seen in Paris is still apparent. 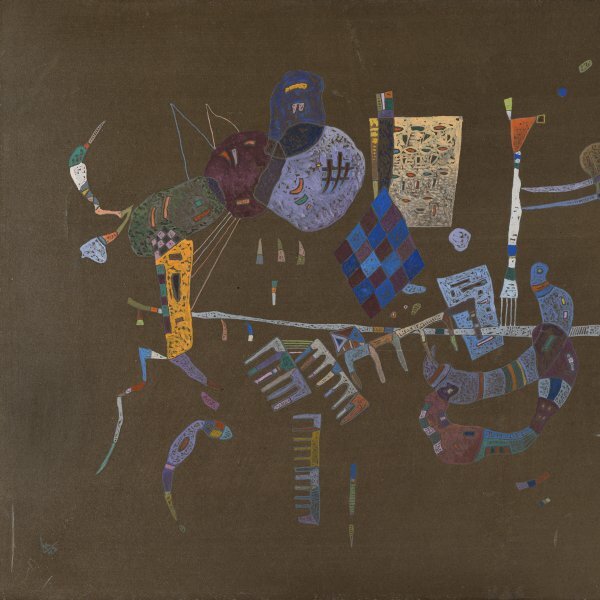 Further evidence for the dating of the work is provided by the fact that the picture, which had lain unnoticed for many years in the artist's last apartment in Neuilly-sur-Seine and which was rediscovered by Kandinsky's widow, was found wrapped in a copy of a Munich newspaper, the Münchner Neueste Nachrichten, dated 1908. The title, however, is not original nor is the work entered in the artist's handlists, in which he recorded all his major paintings. Houses on the Obermarkt is merely the title used in the catalogue raisonné compiled by Roethel and Benjamin, by which the picture has subsequently been known. The painting depicts the main street of Murnau, seen from a shady side street which runs alongside the Griesbräu Inn. The locality has changed so little, even today, that it is possible to identify exactly the point at which the artist must have set up his easel. The scale of the painting and the freedom in the handling of paint make it likely that the picture was painted en plein air, perhaps in a single session.